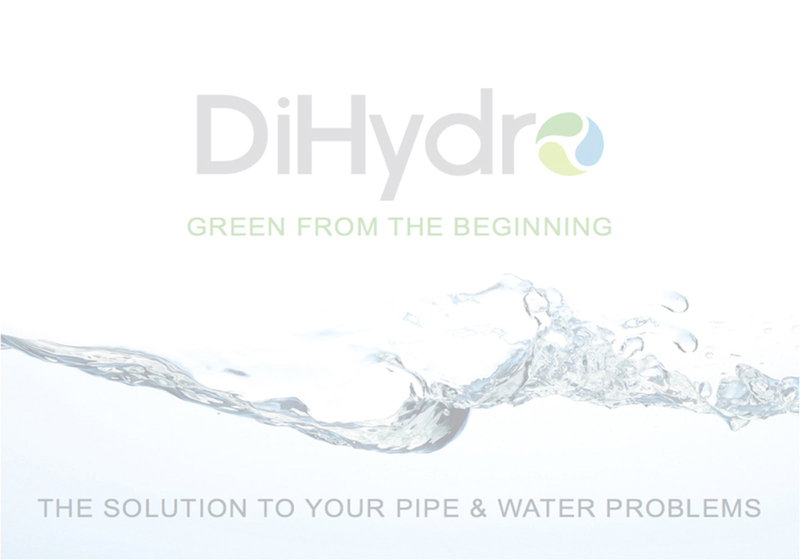 The name of our company is derived from the Greek words "di" meaning "two" and "hydro" meaning "water or liquid." In chemisty, the word "di" is used to denote two atoms of a substance and "hydro" is used to denote the element hydrogen. Thus, the name "DiHydro represents part of the molecular makeup of water, which consists of two atoms of hydrogen and one atom of oxygen per molecule. What is the purpose for DiHydro's service? To offer the only cost-saving alternative to pipe replacement that protects against further corrosion/erosion using a safe, food-grade, FDA approved, silicate solution that coats the pipe interior. What does DiHydro's service entail? What type of substances does DiHydro use to treat potable water? For hard water we use phosphates/RG and for soft water we use a food-grade silicate. How much food-grade silicate can be used in a drinking water system? In galvanized and copper pipes 50 to 100 parts per million (ppm). In the beginning stages of treatment, higher levels may need to be used. Besides regular Corrosion Control Service, what does a DiHydro technician do for each customer? Firstly, our service technicians get to know the building manager and the problems that are common for that facility. Every time one of our technicians visit the building to service the equipment, the technician takes time to ask if there are any problems with slow running hot water or leaks in the hot water piping systems. The DiHydro technician then corrects any of the above issues. Our technicians also keep the manager apprised of any problems in the water system. How does the DiHydro silicate work? What are the benefits of the Corrosion Control Service? Using this method saves the outlay of thousands of dollars to replace pipe as well as the inconvenience of a building shut down and loss of revenue from tenants. For a reasonable monthly fee, we continuously maintain the potable system through preventive corrosion control maintenance. What problems are corrected with the Corrosion Control Service? DiHydro's service controls the buildup of minerals and scale in galvanized pipe, stop red water, controls leaching of lead from solder joints and fixtures, prevents pinhole leaks in copper and extends the life of the piping system. What geographic areas does DiHydro serve? While most of DiHydro's clients are located in the Great Lakes region of the United States and Cananda, we also have clients in most other regions of the continental US. We have even performed services for clients outside of North America. If you think that we may be able to assist you with your specific needs, please do not hesitate to contact us, regardless of your location.